The shocking news that seminal rapper Heavy D died Tuesday at the age of 44 launched an outpouring of emotion from those who knew him and were influenced by him. Many opted to retweet the artist's last postings on Twitter, encouraging statements such as "Never stop believing," and then, just before his death, "BE INSPIRED!" One more thing I would like to mention is that as an alternative to trying to suit all your online degree courses on times that you complete work (considering that people are fatigued when they come home), try to get most of your lessons on the weekends and only 1 or 2 courses in weekdays, even if it means taking some time away from your saturday and sunday. This is really good because on the week-ends, you will be extra rested and concentrated with school work. Thanks for the different ideas I have acquired from your blog. Thanks for your post. Another issue is that to be a photographer includes not only trouble in recording award-winning photographs but also hardships in establishing the best photographic camera suited to your requirements and most especially issues in maintaining the standard of your camera. This can be very genuine and visible for those photography addicts that are in capturing a nature's exciting scenes – the mountains, the actual forests, the actual wild or even the seas. Going to these exciting places definitely requires a digital camera that can meet the wild's severe conditions. I am soo glad there is another rapper dead. Now... if the rest of them just all the sudden died.... alot of people would be happy...hahaha. heavy d,rest in peace bro will never forget my best track sister sister. TO MY,AND ALL OF HIS FANS HEAVY D. WILL BE MISS. I REMEMBER THE CLUB DAYS WHEN THE DJ WOULD PLAY HIS SONGS EVERYONE WOULD GET UP AND JAM TO HIS MUSIC, THEIR WASNT A EMPTY SEAT IN THE HOUSE. THE GOOD OLD DAYS WERE FAB. MY HEART GOES OUT TO HIM AND HIS FAMILY EVERYWHERE. MAY GOD SHINE A LIGHT UPON YOU. YOU WILL BE MISS. REST IN PEACE. I clicked on this thinking it had something to do with astronomy. Wow, I've never heard of him. I met Heavy in the early 1990s. Delivered furniture to his house in Westchester County, NY. Didn't realize who I was delivering to until I saw him inside the house. Very likable and down to earth guy, never acted like a big shot. He joked around with me and my delivery partner. Cool guy, he will be missed. My condolences to his family. This news brought tears to my eyes....He was a great entertainer from back in the day when I went to a 90's concert! I can only imagine how special he was to those who were close to him. I am truly saddened by this news. My thoughts and prayers to the family and close friends of this cool dude! Yesterday, hip-hop lost one of its most notable icons, and a great positive spirit. Everyone who knows his body of work or has met him has only kind words to say about him. Thank you Dwight for being one of the most talented and positive beacons in hip-hop music. And a talented actor to boot, I'll always remember the quality work he did in the 'Roc' series. Rest in peace Heavy D, and bless your great, warm, and kind soul. Great guy,his music in the 80's,I think about the NCO club at Ft. Riley KS. and the fun me and my boys had,Chunky but Funky. they have that already, its called the CMA's. RIP heavy d you left your mark on hip hop forever. May God receive you in his kingdom. I will see you in the after life Heavy D. May you rest in peace and may the Holy Spirit comfort your friends and family. His music was cool. Now he's in a better place. R.I.P Heavy D !!! Always loved you Heavy D, you made being fat Beautiful before Biggie Smalls did, Loved your joint with Super Cat!! "There is no death." SPIRIT NEVER DIES! The late Mr. Dwight Arrington made so many happy with is rapping. He perhaps open and closed many performances. All who sends their condolences know's the impact of this rapper's demise. Heavy D, as he is known went on home to be with is creator. Another soldier fought a greatful battle, is reward is heaven. As he move on in his journey, I am sure he will be rapping his way until he reached the gates and will enter with is gospel rap! God Speed! This is very sad to hear. A man pivotal to R&B and Rap. He will be missed. Wow this video shows he still had so much to give to the world of music. You were a big part of the soundtrack to my childhood. God Bless and R.I.P. Heavy D.
We met in nyc in '98 and you called me "down to earth and approachable" and I laughed and said the same about you. You gave me advice about staying out of "the game" and being real to myself. Well I listened, followed your advice and now I'm proud to say Ive been outta trouble ever since and its because of your advice. Thank you Heavy D for taking those 10 min to find a good in me that I never saw till then. My heart is with you and my condolences to your family. You will be definately missed in Buffalo ny. RIP heave i know this world can be domant and uncaring,you inspired soul for real and the late BIG!!! Oh boo hoo. A million kids just starved to death in the time it took me to post this. Grab some perspective people. I'm with you, who really gives a .... There was no blog filled with tons of people crying when my friend died in the Military but we should all be sad because some over weight, over paid rapper died. NOT!!! Your mother, that's who... idiot. If 'Heavy D' was a 'Light B', things might have turned out for the better! This is a very sad news to my ears, heavy D he is a good man. I respected his kind of humility, i also loved his music so much. He says Baby dont be afraid show ur love. I miss ya heavy.rest in peace. Heavy D was the very beginning of this Brain Rambling Brainwashing HATE RAP, about drugs, violence, the F word, the B word, and the N word. No wonder our young people are frustrated and angry listening to this crap and believing it. I remember the early UPTOWN/MCA Records days. I remember the duet between heavyD & soul for real, heavy RIP. Everyone who knew him respected him, as a person, and as a talent. He took the baton from Whodini, Doug E Fresh, and BDP, and he ran with it. He helped grow the rap game. Original style. Before there was B.I.G, there was Heavy D! Heavy D was one of the great pioneers of rap. He will surely be missed. My condolences goes out to all his friends and family. He was a great guy. Heavy D was not only an entertainer but an honest artist that was also genuine. I guess they needed more hip hop in heaven! I appreciated your profanity free music Heavy D. Live each day like it's your last. One day it will be. Be blessed! FYI Wimp, i'm a female and i am speaking about the death of a good person and you take the time to write something negative..OMG! move along..
RIP Heavy D. You will remain one of the great treasures in the world of Hip-Hop. Even when some people weren't checking for your music like they should have been and instead of trying to change your sound, YOU remain the same to your craft...your heart. One of the few hip-hop artist that didn't disrepect women in your rhymes, never use the "n" word in your rhymes, never felt the need to use in profanity in your rhymes...THANK YOU!! THANK YOU for the body of work you graced us with. You're last tweet was BE INSPIRED....and you TRULY have inspried a nation of many and will continue to do so. Much love & respect to your family, friends & fans!! I never understood the need for uneducated, bitter people to come on these blogs and post negativity. You people really are no better than attention seeking pieces of crap. I was never much into rap, however this man was very talented and from what I can see thru reading multiple articles this man never swore in his songs and there were no illegal drugs found in his home. To generalize all rappers swear and are drugs users is ridiculous. Furthermore, no matter how one lives their life, or if we agree or not.......this was a human being, with family, friends and fans. This is not the place to be posting that gibberish and downright disrespectful to those morning his death. It really is sad how far the individuals in this society have fallen, especially when these people can hide behind anonymity. R.I.P. Heavy D thought and prayers go out to all who loved you. Just because rappers are talentless hacks is no reason to be mean to the dead Heavy D.
It's amazing how someone can say something bad about a person when that person will only be remembered for good during their life. What goes around... But I can remember when Heavy D came out with 'Somebody For Me, and my Dad was about 75 at the time. He loved Heavy D and one day called me to see this big guy rapping on TV. My Dad was smiling so much and getting into the music. That's Heavy's legacy. RIP dude. I do not care for hip-hop, but your acting abilities were impressive; especially in "The Cider House Rules". Thank you for entertaining the masses. Rest now, your toil is over. I saw an advanced screening of that movie. It was so bad it probably contributed to D's death. My girlfriend text me the news and I couldn't believe it, a dark cloud came over me and I was just done. My kids and I watched him perform at the BET Awards and i was so happy to see that he lost weight and was performing with his dancers, i thought that was amazing, my kids loved seeing that. I love showing them our 'old school' guys so they can know where i'm coming from. Miss You Alot.. Heavy D..RIP. "My girlfriend text me the news and I couldn't believe it, a dark cloud came over me and I was just done"
Be a man and take it like one. Anyone know how he died?? I'm guessing it was his heart. I hope everyone realizes its not cool to be overweight, its very unhealthy. Your sentiments are a bit over the top; the man was not Gandhi. I did not care for heavy d & his music. But, god bless his family. they must be heart broken. MAY HEAV R.I.P TO THE FAMILY KEEP YOUR HEAD UP LIKE HE WOULD WANT YOU TO. R.I.P. although I wasn't big on rap/hip-hop I liked quality rap/hip-hop like some Heavy D, peace bro. may Lord Jesus give you peace & rest eternal. "all brothers glorifying God incarnate Jesus Christ"
TRANSLATED: They all pack gats. Water. He was a talented nice guy. The look in eyes said a lot about the kind person he was. Great knowing you man. You cannot even spell PHOTOGRAPHER. I remember Heavy D while growing up in Chicago! He was a great artist & will be sorely missed. God please forgive the terrible comments that people with no Brains have left. RIP Heavy D! God Bless You! you should always be mindfulll of the narrow minded and obviously uneducated comments. you never know what vindictive and computer savy person is out there cooking up a nasty virus for you right now....... or not. Heavy D! I GOT NUTTIN BUT LOVE FOR YOU BRUH! all of my comments were replies but aren't posting that way. whatever, but to all you haters....it's a free country; post what you want but Heavy D deserves and gets more respect than all of you combined have for yourselves. sorry you don't understand how the greatness of a good natured entertainer can affect so many lives positively. RIP Heavy D!!! Dont you know. . . Dont you know!!! What business do you have reading this? You are irrelevant! Heavy D was a positive and inspirational rapper. I was never a HUGE fan but I have alot of memories growing up listening to his music. That said, alot of these negative comments disgust me especially when these people don't even know the man they are speaking on. R.I.P.Mr. Overweight Lover! Heavy D is one of my favorite rappers/had a chance to see him in concert twice-great show! For those bad-mouthing his name & music need to be slapped! Heavy D did not cuss in his songs-jus provide feel-good songs-I used to wake up to "More Bounce" every day in high school. Damn True Hip Hop LEGEND GONE BUT NEVER 4GOTTEN! R.I.P. Zeus keep him safe in the afterlife !!! In my years working in flight as a flight attendant, I've seen and met 'em all. This is the one celebrity who has always stuck in my mind long after meeting him. Most celebrities at best are condescending (which is fine with me in my line of work) most hip hop artist are just plain downright rude, nasty or dismissive. Not him...the absolute definition of a gentleman as well as someone who could talk to anyone regardless of what their level was. RIP. To everyone, never mind the things 'haters' write about others on the internet, 99.9% of the time it's merely a reflection on how they actually feel about themselves. Well said Tony T. Sometimes I read the hateful comments and it makes me angry and I have to catch myself trying to understand these folks. Once I readjust, I just smh and keep it moving b/c they're not even worth my energy nor thoughts. I agree, its just a reflection of who they are. Haters full of hate. ZEUS keep him safe !!! Wow..I was stationed in Germany when Heavy D first came onto the scene. I loved dancing to his music at the clubs. So sad. He will be truly missed! RIP Heavy D!!! Jus recently saw heavy d on the BET hip hop awards and he put the icing on the cake with a medley uv his ol' school classics. Pioneer indeed!! I am heartbroken to hear of the recent loss of one of my favorite artist of ALL TIME!! As a young teenager, Heavy D stood out (and always will) because he kept it clean, and his beats were banging! He truly deserved all the success he career afforded him...what a talented soul. Heavy D will be greatly missed. Love ya, Heavy! Goodbye Mr. Bigstuff, we loved you so much. Thanks for putting Mt Vernon on the map. R.I.P. R.I.P. Heavy D. I remember your music all the way back in the early 90's when I was still a kid. Was his music truly inspirtional or was it full of 4 letter words? Have never heard of the gentleman nor his music. If his music was truly inspiritional as these posts suggest then my thougjhts and prayers go with him, his fans and family and all his friends! Brian1952 – Heavy D never used any curses in his RAP. His was inspirational. If you don't even know of him, why say anything? That makes no sense! If you are not aware or concerned for that matter at the passng of a Legend – then why are you posting on this blog? Im sorry that you missed the best era of Hip hop and music for that matter during the 80's and 90's. Have you heard the saying- if you don't have anything nice to say then don't say anything at all? Try it – it applies to DEATH! If you don't know of him, why comment. Keep your stupidity hidden, jerk. He commented on the posting of his death because it was about a human being dying and it's always sad to hear of anyone losing their life. As I recall Mr. Brian said if he was the person that we all are saying he was, his heart goes out to his fans and family. Clearly he can make a comment about someone passing, he doesnt have to know them. It's called GIVING CONDOLENCES! PAYING RESPECT! And you don't have to know anyone to extend that. Thanks Brian for inquiring about the man and paying your respects, the people who knew him, his family and the ones who loved his music really appreciate your prayers. Thanks for being mature about it. I agree with Karen. He had good clean rap music before the itchs and oes became the new name for women... I grew up listening to him on the radio and he pretty much rapped about Love and one song I remember relating to black women. You should look him up on youtube if your mind is opened to listening to rap music. He was a great entertainer with a very positive vocabulary. You really need to listen to his music, my opinion "Peaceful Journey" was one of his best albums. God bless and RIP Heavy! You will always be loved and missed. I remeber only go times listening to his music,R I P you will be miss. heavy D... i hurt more when i watched the video.. RIP. Lord I hurt when I heard about heavy d...I'm still in that mood. Lord rest his soul as we remember his music. Best song was "dem no worry we" with Supercat. Classic. Yes I love his regaee song "Dem Dont Worry We" 🙂 Classic dancehall song that makes you feel happy! CNN;One request please when a celebrity is ill or dies please filter vile hateful remarks,these people have loved ones that are grieving or trying to help the ill to recuperate they didn't ask for and don't need these ugly comments thank you. As much as we (the publc & fans) may want them to, they won't and that's just sad. Heavy had a heart attack outside hiz home. RIP D.
Wow, you sound pretty hate-filled. I will be forever inspired, " Love You Heavy D " . SOLJA GURL? Boy, you people need to be in school – not blogging. That is a shame. Only 44. May he go to a better place where he can be with his loved ones who have gone before him. May GOD Bless his soul and his friends and family. I would like to offer my condolence to the family may the good lord be with you.Also today we a gold medalist and heavy weight champion of the world Smokin'Joe Frazier love you. R.I.P. Heavy D. You will be missed. Luv ya. Heavy D. Beautiful spirit. Talented brother. An infectious smile!! You provided your fans with a tremendous gift: wonderful music and lyrics. Rest in peace. You will be missed. Wow I just listening to Janets" Alright With Me'I love the part when he says 'I'm a big mac you're a chicken mc nugget lol,he'll be missed. This is so sad. Heavy D you were truly an inspiration and a wonderful human being. My condolences goes out to his family. R.I.P, Heavy D!! My heart goes out to his family. May the Lord Jesus Christ, keep them. Beyond sad you are much loved and will always be missed. So much talent now in heaven what a party. 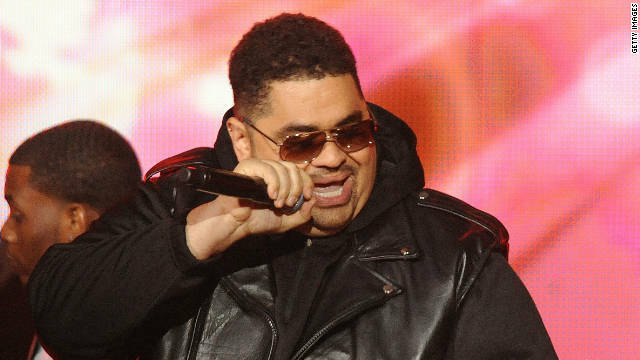 RIP Heavy D...a true HipHop Icon and inspiration to many others...my condolences to your family.